Can you tell the difference between a flush and three of a kind? Do you like simple games with great odds? Do you think 3 cards are better than 2? Then Three Card Poker is for you! A lot of casino games players stick to the games they know…. blackjack, slots, and video poker. Learning new games could take away valuable time from their favorite table or machine. However, if you have 5 minutes and are willing to learn a simple game that can win you tons of cash, Three Card Poker is definitely for you! In this article I will take you through a full game of Three Card Poker (with complete illustrations). In less than 5 minutes from now you will be ready to take on the Three Card Poker tables yourself with confidence. Let’s get started! Note: If you want to follow along with this guide, you can download a free Three Card Poker game here. To start the game, we first need to make a bet. In the lower right hand portion of the Three Card Poker screen you will see poker chips ranging in value from $1 to $500. 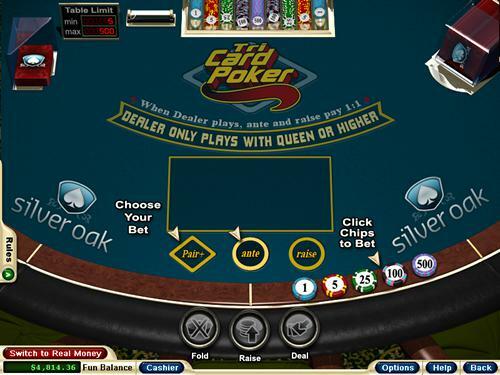 To make a bet in Three Card Poker, all you have to do is click on the chip denomination that you wish to wager. Note: Before you click on the $5 chip, be sure that the “Ante” circle is highlighted. If your chip went to the “Pair +” area, simply right-click on the chip to take back the bet. At this point, we need to take a look at our cards and decide if we think they are good enough to continue. If we don’t like the cards, we simply have to click on the “Fold” button. If we click on fold, we lose the $5 bet, and the game starts over. However, if I like my cards and decide to play with them, I simply click on the “Raise” button in order to continue playing. To continue playing, however, you have to make another bet of the same value as your first bet. Since we originally bet $5 on this hand, our bet increases by $5 when we click on “Raise”. I like this hand and want to play with it (I’ll teach you all about which hands are good to play with and which ones aren’t in an upcoming article… stay tuned!). To keep playing, I click on “Raise”. Since our cards make a higher poker hand than the dealer’s, we win! From the screenshot above, you can see that we won $10 on this hand. In the next article about how to play Three Card Poker, we will go over the rules of Three Card Poker, and more importantly, how to win! If you want to get a head start and start playing now, click on the Play Now button below to download a free Three Card Poker game along with over 130 other free online casino games!